In case you’re wondering why BP has turned to robots to stop the Deepwater Horizon oil leak 5,000 feet (1,500 m) underwater: the deepest humans have ever gone walking underwater is only 381 meters. And that was in 1979. 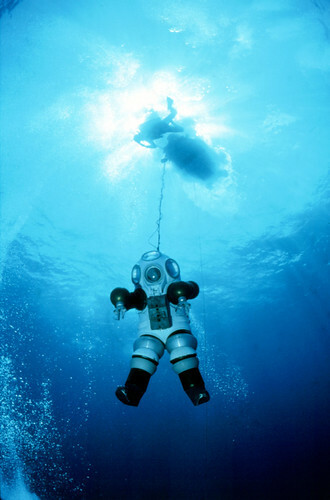 Developed in the late 1960s, the JIM Suit took deep-sea diving to a whole new level – both depth-wise and stylistically. Based on earlier old-school diving suits that wouldn’t look out of place in a Captain Nemo lithograph, the JIM updated the all-in-one with a dose of clean 60s sci-fi design. Paving the way for what became known as Atmospheric Diving Suits, the JIM was effectively a one-person submarine. Instead of dealing with complicated gas mixtures, freezing cold water and decompression sickness, you could breath regular air, surface quickly and dress casually inside, with a thick wool jumper being the garment of choice among users. The original suit, measuring 6’6” and featuring eight movable joints, first saw action in 1974, when it was used to recover lost oil tanker chains in the Canary Islands. Two years later, it was used on an extreme dive in the Arctic, working on an oil well at a depth of 275 meters for six hours. 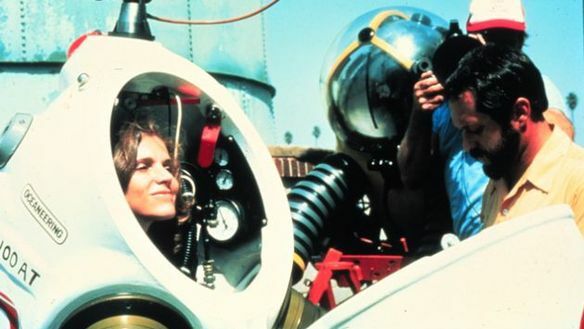 It was in 1979 that American oceanographer Sylvia Earle (video above — see 3:11) set a world record in the JIM Suit, descending to a depth of 381m before detaching from the ship to walk across the sea floor. For two and a half hours, she strolled along the bottom untethered, browsing a gorgeous array of mysterious undersea life. It was the deepest such walk before or since. The experience inspired Earle to work on mini-submarines with one of JIM’s engineers, Graham Hawkes. The JIMs were still in use during the 1980s, including in the recovery of a Wellington Bomber from Loch Ness in 1986. But they were soon overtaken by its more advanced successor, the WASP suit. By 1990, the JIM suit had gone out of commercial operation (DHB had been acquired by undersea engineering firm Oceaneering), and today resides mainly in museums. It was also committed to celluloid twice, once in the James Bond film “For Your Eyes Only”, and again in the 1989 sci-fi/horror film DeepStar Six.